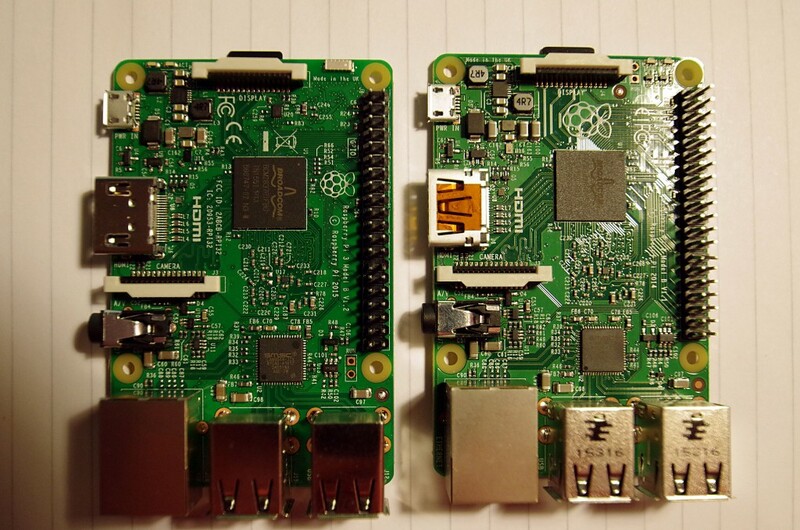 On the first birthday of the Raspberry Pi (That’s the first anniversary of the original February 29th launch!) The fantastic foundation brings out the Model B v3. Upgraded power handling – capable of handling 2.5 amps at 5v over the board. You need a good PSU then you can run lots of USB and GPIO things. $35 – around £26 to £27 in the UK. The on-board power distribution can handle up to 2.5 amps at 5v now and USB power control has been dropped – it’s fixed at 1.2 amps, so make sure you have a good PSU capable of delivering over 2 amps if you want to make full use of it – I did a test and had 4 other Raspberry Pi’s being powered off the USB ports. USB over current detection is still present and will show up in the logs should you exceeded the overall 1.2 amp limit. The Wi-Fi is not connected to the existing USB interface. It’s on an interface of it’s own – It is using the SDIO interface via the GPIO so it won’t use any precious USB bandwidth. This should improve performance for those using the Pi as a Wi-Fi access point, if nothing else. Some quick benchmarks have shown speeds of 40Mb/sec via Wi-Fi. The BLE interface runs off one of the Pi’s serial ports. It has 2 serial ports and only one has been exposed via the GPIO previously. I understand it’s actually running off the original one, which is now using the secondary, but some internal munging has happened to keep that as /dev/ttyAMA0 for user applications. Raspbian hasn’t yet been updated to make use of the 64-bit cores… Give it time. In some informal chats with the boffins at Pi HQ they mention running out of GPIO pins used for the Wi-Fi and BLE interfaces, and so the LEDs and under-voltage signal, etc. are on a separate GPIO expander controlled by the GPU. There is no USB power control it’s now fixed at 1.2A. I’ll try to clarify this when they manage to get some spare time to breathe after the work required to get this to product! wiringPi has been updated and it will be available via apt-get/update shortly, but for now you can get it directly via the downloads method on the wiringPi website. And well that’s that! Happy Birthday Raspberry Pi. And still for $35 too.